Got this at a reasonable price and thought I could use the lower loft to gain a bit of extra distance. Club works great off the tee and gives you that bit of extra distance. It's a tough club to hit off the deck though with the lower loft keeping the ball close to the ground. I have the 14.5 degree 3 wood with the factory stiff graphite shaft. The club is long and straight. Works great from the tee and from the fairway. Face height is just right - not too tall and not too shallow. Long and forgiving too. Doesn't spin the ball so much so the ball rolls. Didn't like the UL shaft so i took a steel. UL was too long (33.5") and quite flexible. I was i the market for some fairway woods and tried a heap at my local pro shop the first hit i had with the cobra gb 3 wood i was sold.ended up buying a3, 5 and 7 wood (no offset)these woods are very easy to hit just swing easliy and watch the ball go. I tested this club against the Calloway Steelhead III and the Taylor Made 200 series 3-woods. 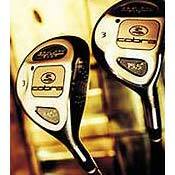 I hit the Cobra 255 yards average 10 yards further and straighter than the other clubs. I had a stock graphite shaft in the Cobra and Steel shafts in the Calloway and Taylor Made. The cobra is definately more bang for the buck. With graphite shaft in the Calloway the performance was the same as the cobra but the Calloway costs over $100 more. The Talor Made 200 was the weakest and least accurate. I think for shorter hitters you will see an even greater benefit in the cobra because of the lighter graphite shaft. For those who aren''t concerned about money I would test other clubs with the grapite shafts. WOW! Folks, I have tried every 3 wood on the market. I struggled with finding anything for my second shot - UNTIL NOW! These babies are fantastic. They get the ball up, and LONG. I have a slice because I come over the top. HOwever, these clubs take care of that and with just a little forearm turn over after hitting the ball, the baby starts to turn right then comes right back into line. I am hitting the 3 wood 200 yards and I have never done that with any other fairway wood. I''ve had tight lies, callaway, taylor made, tour edge, you name it I''ve tried it (quite the golf club junkie) - Buy it you''ll like it - Hey Mikey! Just got a driver 10.5 off e-bay and can''t wait to hit it. Model Reviewed: Cobra Gravity Back 14.5 deg. I couldn''t pass up this deal. $78 for a new club. It has a stock stiff shaft. This club has some heft to it, which I like. Most clubs are way too light. I haven''t played a round with it yet but on the range this club is very solid. I played with those low profile clubs which are good off the fairway but treacherous off the tee. This club is excellent off the tee. On the range mat, this club was very solid. I''m sure it will be just as good off the fairway (granted I stay on the fairway). Ram Concept Low, Steelhead Plus, Adams Tight Lies and Orlimar. This wood is the best economically priced fairway metal on the market, I have yet to find any other club that comes near to the cobra, let alone better than it. The 5 wood I bought was the offset version with a loft of 18 degrees. It is very heavy even with a graphite shaft which means that there is a low swing path resulting in alot of height and alot of distance. As far as I am concerned there are only two problems with the club, 1) it has a very shallow face which means teeing it up is risky. The second problem is that there is on average about 8 feet of roll on this club once the ball lands. In fact on a wet course I could stop it in 2 feet. Apart from these faults it is perfect. If you think there is a better wood tell me!! Having happily played King Cobra Original Baffler 14 degree for a year and half, I decided to change it to a little bit bigger and one with weithtings. There is nothing wrong with the Baffler yet it is a bit small to hit it hard from the tee and the rail at bottom makes me hard hit a ball from fairway (it is perfectly good to hit from the rough). Although I have been trying Callaway, Ping and Titliest one, I wasn''t really satisfied with them since there is no real cost and effect advantage. For me they are actually the same as my old Baffler. Here comes this Cobra Gravity back wood! As Cobra is about to change its wood range, it is on sale now on 99 pounds with graphite shaft compared with 189 pounds a month ago. I decided to have a go at our local golf shop and it hooked me at the bery first short. It has got double weithtings, one at the bottom and the other at the back, and I think it helps me to cure my occasional slice. There is one with offset in 15.5 degree and the tour one without offset in 14.5 degree. For me the first one tends to go left because of the offset while the second one goes longer and straithter. On course, it works very well! With my swing speed of 101 mph in 3 wood, it delivers my ball far away from the tee. Twice I with this 3 wood outdrived my friends working with their drivers. I can hit around 250 yard from the tee while around 230 yard from the fairway. The tradectory of the ball is really impresive: it is not too high in the air while goes around the same hight for a while, which makes longer distance with this wood. All in all I do recommand this wood for mid handy like me yet the offset one for high handy which is fighting against slice. King cobra Baffler 14 degree, Callaway Stillhead Plus 3 wood, Ping isi 3 wood, Titleist 975F 13.5 degree. This is by far the best 3 wood you can get. Your able to shape your shots real well. Very straight with a nice feel. I thought it gave a little more distance also. Great club for anyone. Cheap!!!!! !